On 06 February 1685, James Stuart, Duke of York, succeeded Charles ll as king of England, Ireland and as James VII, king of Scotland. Charles had died without leaving legitimate children though quite a number of illegitimate ones. James had fled to the continent during the years of the Commonwealth and had returned with Charles ll at the time of the restoration of the monarchy. He had not expected to become king and had in his years of exile converted to Roman Catholicism. He was crowned king of England on 23rd April 1685 but never did take the Scottish Coronation Oath. As a Catholic, many English people resented him even though he was strongly in favour of tolerance for all faiths. There were many attempts to stop him from succeeding to the throne. 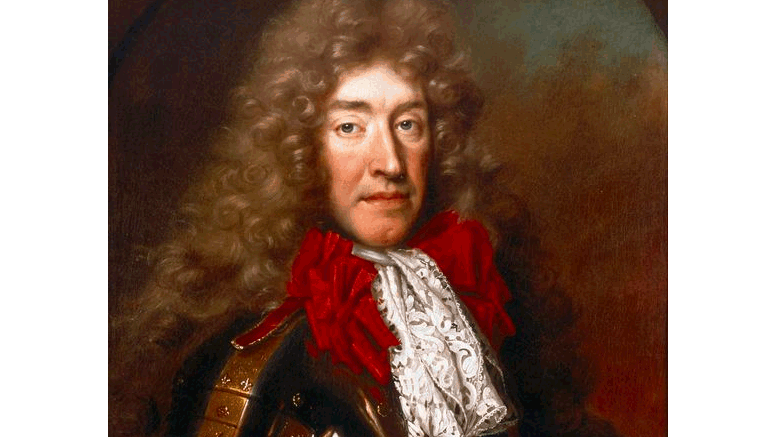 The first rebellion against his kingship came as early as June 1685 when the Duke of Monmouth a protestant illegitimate son of Charles ll proclaimed himself king. He was defeated by James army at the battle of Sedgemoor in July and executed in the Tower of London within a few days. The severity of punishment of the rebels, and the activities of the infamous Judge Jeffreys in hunting them down, further alarmed those fearful of James ll. From his days as Duke of York, when he was heavily involved in the slave trade, James carried a reputation for cruelty. In Ireland, the Catholic Irish rejoiced as James, using his kingly powers, nullified the Test Act which meant that Catholics and non-Conformists could advance in both military and civil careers. James’ lord deputy in Ireland was Richard Talbot the Earl of Tyrconnell and predictably he started replacing Protestant officials with Catholics. By 1689 the vast majority of those sitting in the Irish parliament were of the Catholic faith. This, naturally, caused the Irish Protestants to fear a re-enactment of the 1641 rebellion. This fear was particularly strong in Ulster where Protestants, mostly from the Scottish lowlands, but many also from England, had appropriated most of the land from the days of Cromwell and the Ulster Plantations. James was married twice. His first wife was Anne Hyde, who has the distinction of being the last English woman, prior to Lady Diana Spencer, to be married to an heir to the throne. She produced 8 children for him but only two, Anne and Mary survived. Both of these daughters were Protestant. His wife Anne died in March 1671. His second wife, whom he married in 1673, was Marie the Princess of Modena. She produced 6 children for him, 2 of whom were male, Charles and James. Charles died after one month but James (1688 to 1766) was a healthy child and, a Catholic. This in itself caused more unease to the Protestants and there were many accusations, none proved, that the new heir was not really a son of the King.